I couldn’t take the Christmas decorations any more. Overnight they all went from festive and cheery and homey to holy-crap-what-is-all-this-stuff-doing-in-my-way?! GAH! Goodbye Christmas 2010! Now I can clean up the rest of my house which has, apparently, been declared a Federal Disaster Area. Or possibly a Super Fund site. I’m not sure. I have the paperwork around here somewhere…. Next Post Because I am serious about the postaday challenge…. Yeah, I’m delighted to get the decorations out in early December, but equally happy to clear those spaces before January 1. I love the coziness when they’re out, adore the clean lines when they’re gone. Win, win. if it makes you feel any better, I took the tree down last weekend but still have the random decorations up, along with 4 boxes of ornaments sitting in my dining room to put away. 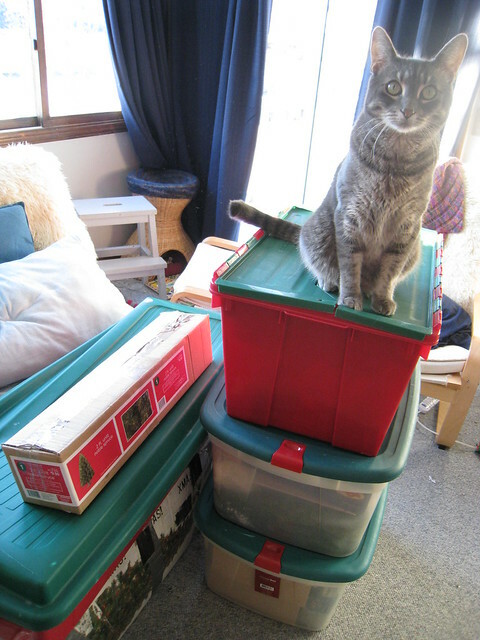 just can’t seem to motivate myself to haul everything 2 flights up to the attic.